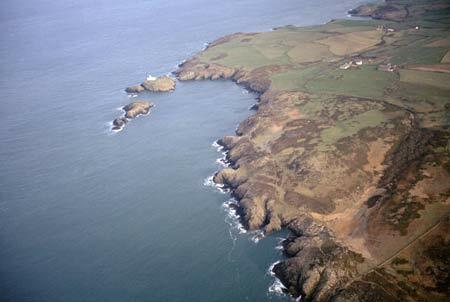 A character area of modern Pembrokeshire comprising a narrow coastal strip, forming part of the medieval Cantref Pebidiog, or ‘Dewisland’. Pebidiog was held directly by the Bishops of St David’s, having represented the core of the bishopric from 1082 when it was granted (or confirmed) by Rhys ap Tewdwr, king of pre-Anglo-Norman Conquest Dyfed, to Bishop Sulien. It lies within the parishes of Llanwnda and St Nicholas. Historically this coastal strip has always been marginal land, and includes a larger area of formal common land, Ciliau Moor Common (with Waun Morfa and Garn Nelu Commons). A small area of common at Crincoed Point was enclosed in1815. However, a larger area of unenclosed land to the west, at Ogof-y-drwg, overlies an undated field system, which may be prehistoric - among the former occupation sites in this area are two coastal promontory forts of the Iron Age. A large, rectangular earthwork on the island of Ynys Meicel has been interpreted as an early medieval ecclesiastical site, but is probably later, and secular in origin. Ciliau may be the ‘Kelle’ recorded in a survey of 1326, when it included 1 carucate of ploughland. Nevertheless past land-use within this area was mainly as rough grazing. There are few places suitable for landing small boats along this stretch of high sea cliff, but a French invasion force landed at Carregwastad Point during the (abortive) last invasion of Britain of 1797. The area’s main function is now as a corridor for the Pembrokeshire Coast Path, set between the enclosed farmland and the edges of the sea cliffs. However, several built features, of recent date, are very prominent within the landscape. Strumble Head lighthouse on Ynys Meicel was first proposed by Trinity House in 1825 but was not built in 1908-9. It may have succeeded an earlier, smaller lighthouse built nearby on the mainland. This historic landscape character area comprises approximately 13 km of high, exposed and windswept sea cliffs and cliff top running from Goodwick harbour in the east to Aber-Bach in the west. In places the cliffs achieve heights of over 100m. It is an inhospitable coast, with no safe landing places. A band of rough ground is sandwiched between the cliff top and farmland. This band is generally narrow, varying between just a few metres and 50m, but in a few locations, as at Ogof-y-drwg, it broadens to several hundred metres. The rough ground and scrubby bushes of Ciliau Moor are included in this area. 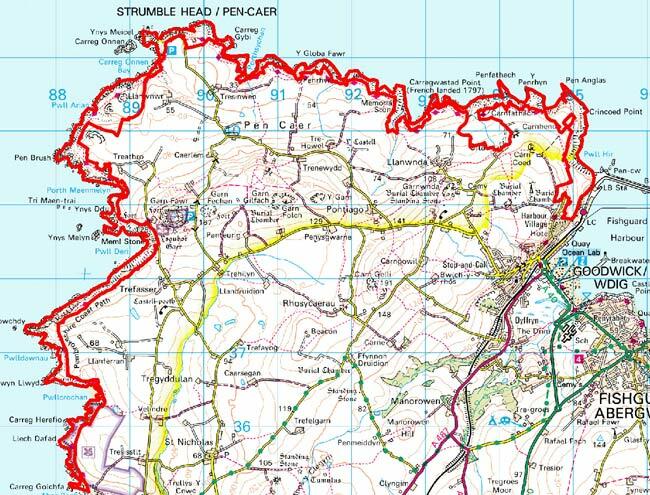 The Pembrokeshire Coast Path runs along the complete length of cliff top. There are no permanently inhabited buildings in this area. 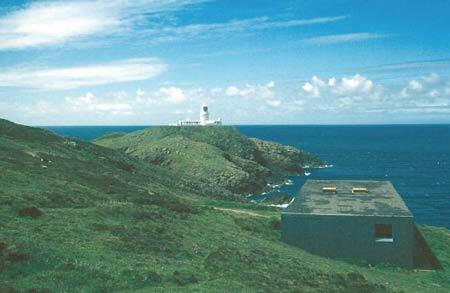 Strumble Head lighthouse is now automated and its light is visible for 29 miles. It sits in a walled enclosure together with the former keeper’s cottage; the stone-built whitewashed complex forming a distinctive element of the landscape. There are also radio masts at nearby Pencaer. Other buildings include several World War 2 installations. Most prominent of these is a brick structure, close to Strumble Head lighthouse, which is now converted to a bird hide. There are also several buildings of a radar station close to Pant-y-Beudy Farm. Archaeological sites are varied, and include: several flint findspots of mesolithic or bronze age date; a bronze age round barrow; two iron age promontory forts (including the scheduled site of Dinas Mawr); field systems of unknown date; the site on Ynys Meicel and a possible rabbit warren. The coastal strip is an extremely well defined historic character area. Its historic components are entirely different from those that compose the neighbouring landscapes of farms and fields.